Despite most neotropical marsupials have arboreal habits, methodological and analytical difficulties usually hamper the study of vertical movements of individuals. We used the spool-and-line technique to record height and incline of movements, escape behaviour and use of refuges by the opossum Micoureus paraguayanus (Tate, 1931) (Didelphimorphia, Didelphidae) in the Atlantic Forest, Brazil. A new index for measuring intensity of vertical use of space by individuals is introduced and applied to compare movements of males and females of M. paraguayanus. Activity on the ground was scarce and refuges were located exclusively above-ground. The lower stratum was the most used by individuals. Females had greater intensity of vertical use than males, exploring more the vertical axis of the forest. The results confirm arboreal habits of M. paraguayanus and demonstrate that males and females use differently the vertical dimension of habitat. 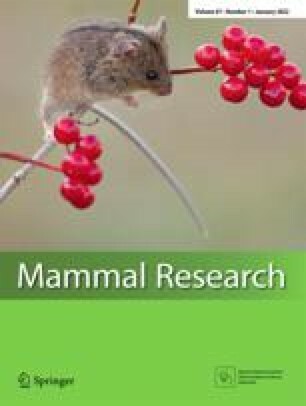 The new index presented can be a valuable tool for studying use of space by arboreal small mammals.